Hot on the heels of the New Noise Music Festival, Santa Barbara has another chance to participate in a concert project, this time presented by the producers of Coachella Valley Music & Arts Festival. Powered by Life Box Set, CALI RUTA promotes the cross-pollination of Latin and Anglo musical talent. On November 12, Velvet Jones (423 State St) plays host right here in Santa Barbara as part of this year’s route of performances across So Cal. 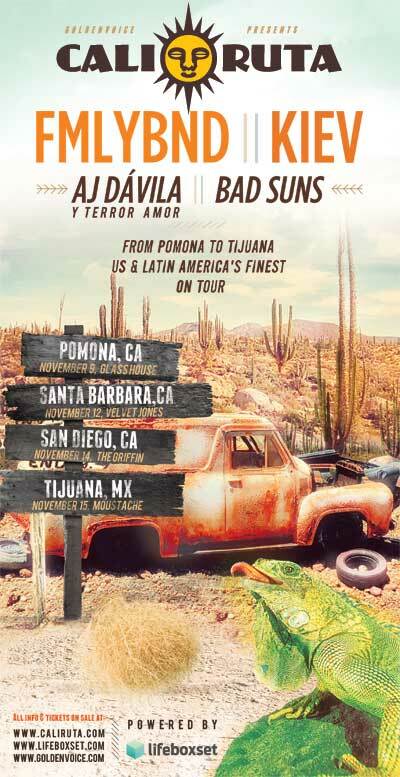 Kiev and FMLYBND will co-headline with performances by AJ Davila and Bad Suns. Think fun indie-dance party with a Latin alternative twist. Doors open at 7, and music starts at 8. Ages 18+. Tickets aree $10 and can be bought at velvet-jones.com. See you there! How do I post an event for Oreana? Please send information and any images for upcoming events at Oreana to stephanie@wall-spacegallery.com. I will make sure your event gets added to the Funk Zone site. If you have any other questions, please call me at wall space gallery: 805-637-3898.